It has been a crazy few months, the heat here in the U.K. is like nothing I have experienced in my life, our Summer is usually a mix of a little sunshine, cloudy days and random periods of torrential rain. Not so this year and that has had a major effect on my mojo and painting has been almost impossible, my house is South facing and my studio is like an oven. 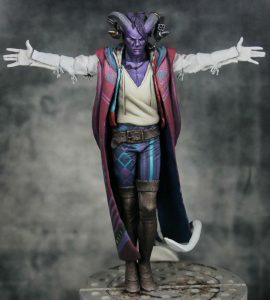 So the Works In Progress (WIP) for me have mainly been about assembling figures and finishing some projects slowly, I have also been focusing my efforts on the magazine and am also now planning to release a fantasy version too, so keep your eyes peeled for that! 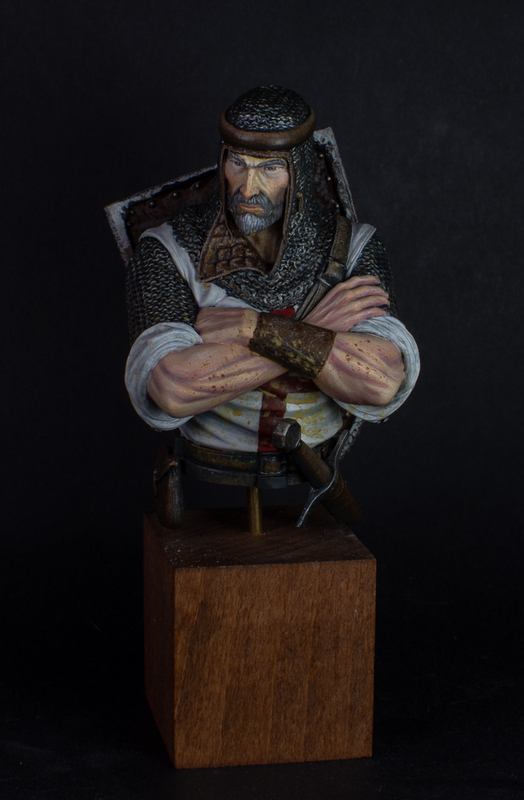 I finished The Guardian bust from BestSoldiers which was a lot of fun to paint, i’m currently struggling my way through the European Knight bust from Young Miniatures, which i’m hoping to finish soon! We are in to the school holidays here and quite frankly the fact that all of my children are still living is testament to my powers of patience and endurance! Less than a week too until the first Arsenal football match of the new season and i’m super excited, truth be told (we lost lol)! I really need to get more focused with my time though especially as Euro Miniature Expo at Folkestone is fast approaching. 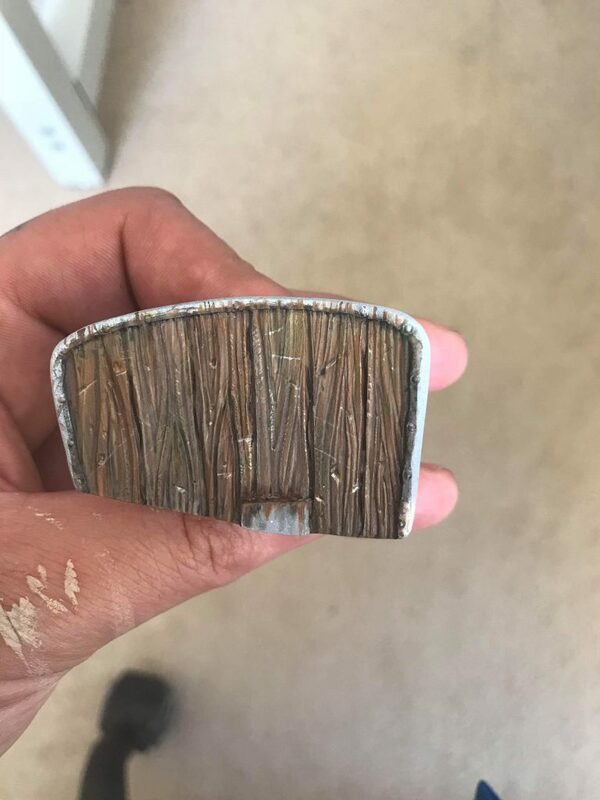 I have been having fun perfecting realistic finishes such as wood, freehand designs, textures etc I think that is definitely the direction I aim to take my painting. My earthy style has never truly suited the more vibrant fantasy releases and every time I entered Golden Demon (8 years) every single piece took finalist but never placed in top 3, so maybe I have finally found my niche within this hobby of ours. It’s been a long time since the last Works In Progress (WIP) post. I’ve been to Duke of Bavaria back in April, there I won a bronze medal with my fantasy display. 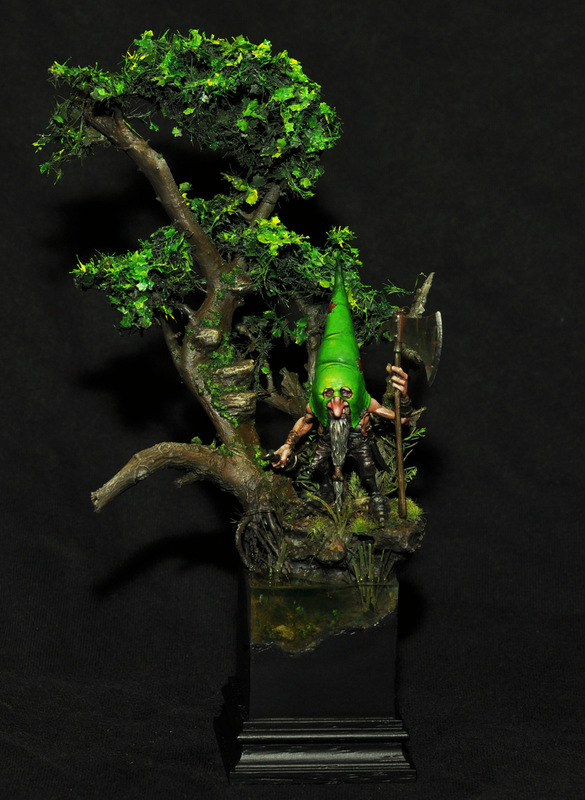 In that display were my Savage Escher and my Guardian of the Faerie Mound, which was my green version of Red Cap from Blacksmith miniatues’ kickstarter the World of Jean-Baptiste Monge. I am very proud of these two pieces, where I have worked a lot with the power of colour and enjoyed myself immensely just working on them and that shows I think. Back in May I made the Dungeon keeper, my version of Romain van den Bogaert’s Gatekeeper. 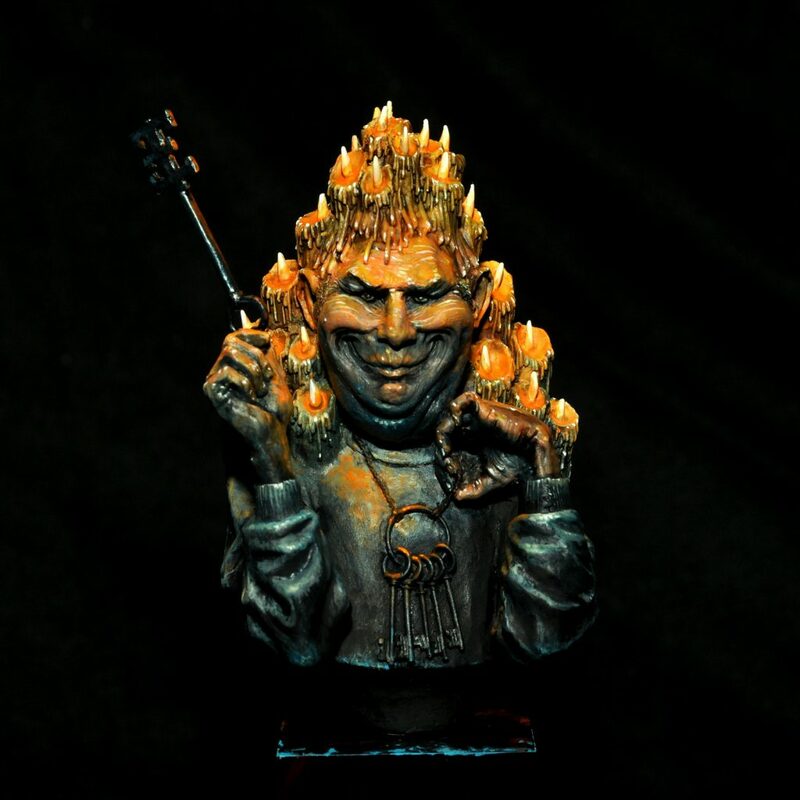 That weird, sadistic looking guy with all the candles all over his shoulders and brow. I experimented with a more direct, fast and expressive painting style. One that will show more brush strokes, be more painterly and well… expressive. It was done fast and to the point, many people would think it was not good because it was fast… I don’t think so, that was a deliberate choice in order to work in a more expressive way in my painting. It is a way I will experiment more with in some future projects, definitely not all of them, but there will be models from time to time, that will benefit from that kind of treatment. At the moment I am working on a small regiment of plague bearers for an oldhammer project I have going on the side. I have also assembled my Gorgon model from Aradia’s Devine Comedy kickstarter. This may very well become my next showpiece. The last month or so hasn’t seen any real painting at my end, Works In Progress (WIP) have taken the back burner due to the heat here in Sweden which has been terrible and sitting under a hot lamp (I need to get a LED one I think) wasn’t on my radar. Instead I have been planning future projects, among others that I hope to be competition entries for SMC in October. The only painting I have done during this is a commission for an old friend, namely an old Epic Armageddon army because it doesn’t require sitting under the painting lamp so I could sit on the couch by the fan and paint. 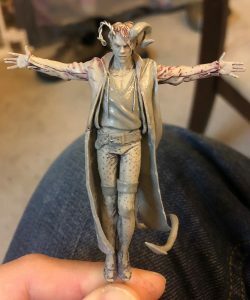 I did manage to finish two projects before the heat waves hit us, first is Aradia Miniature’s Dante bust that I’ve been wanting to paint since I first saw it as part of their Kickstarter. It was a very fun bust to paint and the quality is outstanding. It almost felt like it was painting itself. The colour scheme was picked from various paintings of Dante that I found during the research phase. I added some cold shading and very warm highlights to represent the contrast between heaven and hell in the books. The second bust I finished is the same as Jay showed above, The Guardian from BestSoldiers. It was painted as part of a small paint-a-long for Jay’s painting group. It was also a very fun bust to paint and I’m very happy with the outcome over all. I’ve always had difficulties painting male skin tones so these two busts have given me much needed experience painting it and both of them turned out much better than any of my previous attempts. Next up will be to find my motivation again now when the temperature has started to drop here, and get started on what I’m bringing to SMC. The past few months have been keeping me pretty busy, though not necessarily with too much for a Works In Progress (WIP) post, as my family and I are planning to move to a new city, so I’ve been carefully packing up all of my figures and painting supplies. I’ll be very relieved when I get them unpacked and see everything has arrived safely! As far as actual painting goes, I’ve worked on several projects since our last update. I managed to finish off the 54mm Crusader. I’ve already written an article on the freehand designs for the Illustrated Historical Artist (issue 4), but I may pick another portion of the figure to do a second tutorial. As often happens, what was supposed to be a ‘quick’ project ended up taking a lot longer than I thought. But that’s just a sign that I’ve been enjoying the piece and decided to put more work into it! This project also gave me the opportunity to further refine my TMM, so I’m eager to take on another knight in the near future. Another project that is nearing completion is the 1/35 scale dwarf, Brom, from Engima Miniatures. This is a sculpt with a lot of character, so I’ve tried to do it justice. 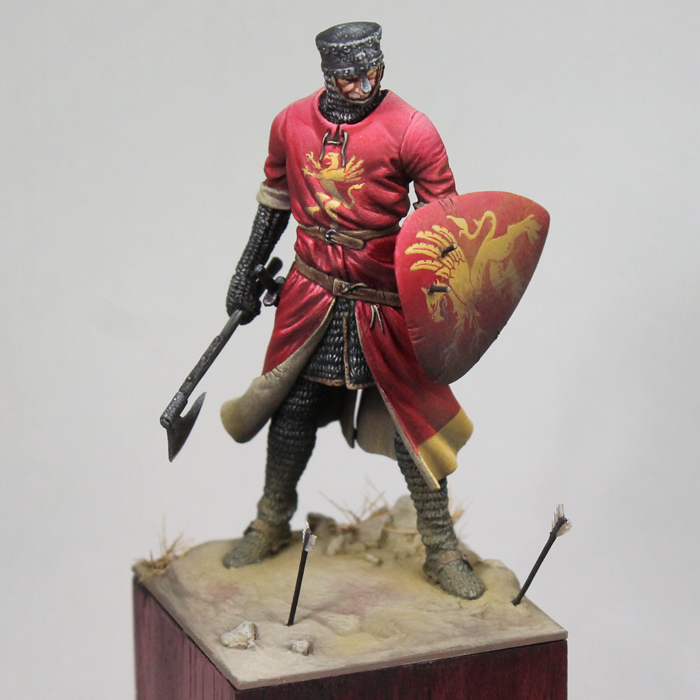 On this piece (and to a lesser extent the crusader) I used the sculpt and pose to come up with a story before I even started painting him. Who is this character and what has he been (or is he) doing? You can just paint a dwarf or a knight, but if you want it to seem like it’s from its own world, you should think about what it’s doing and how it interacts with its surroundings. I’m in the middle of writing an article on this approach, with Brom as the main example, so be sure to look for it on FigureMentors in the coming weeks. The other big project I’ve been spending time on is a 75mm tiefling, a real Work In Progress (WIP). This piece is based on a character from Critical Role (an online D&D show), so much of the color and design work is based on the official character art. I’ve wanted to do a figure based on one of the characters for some time, but none of them are all that close to any commercial kit I’m aware of. After a lot of thought, I ended up taking Terrible Kids Stuff’s The Child Thief and made a number of modifications. I added the horns, tail, belt and boot. I took the short jacket and extended it, add some additional details to the sleeves as well. The character’s clothing is covered with designs, so that has been the big challenge. Just about every inch of the coat will be covered with some sort of freehand, so I’ve still got a way to go. But I’m quite happy with the conversion and progress, and it’s really fun to paint a truly unique figure. That’s it for now, stay tuned to see what we will be getting up to over the coming weeks!